Teachers in Gulf Breeze, Florida are being treated to a barbecue on April 5 courtesy of the Gulf Breeze Optimist Club and the Education Committee of the Gulf Breeze Chamber of Commerce. The activity is taking place during the lunch hour of the scheduled teacher planning day to show the community's appreciation of the teachers and their dedication to the students and community. Different community organizations contributed to the effort and community members are welcome to join the sponsoring organizations to help serve. What a nice way to connect business, education, community and service. Who said there was no such thing as a free lunch? Someone asked me to participate in a survey today and I wanted to help. However, when I looked at the choices that were given for answers I realized that our minds were miles apart. The survey asked under what conditions would I attend an Optimist International convention without receiving reimbursement*. 1. To learn about the latest new fad. 3. To learn new skills. 4. To catch up with old friends. 1. To have the opportunity to participate in the governance of the organization. 2. To gain the knowledge that I need to provide sound counsel. 3. To share optimism with others. 5. To discover what will be emphasized in the coming year. That's my list. What is yours? *Optimist International Club and District leaders sometimes receive reimbursement for travel and lodging from their clubs or districts. I have attended 10 international conventions and have received a stipend three times. As a district governor, some of my expenses will be reimbursed this year. Optimist Clubs are just finishing the second quarter of the administrative year. There is always a lot of jockeying for position at this time of year because whether you believe the year is "half started" or "half over," reality begins to set in. If you are a club leader, you might ask yourself, will I be able to accomplish everything that you wanted to do in the time that remains? Some clubs and leaders might want to adjust their goals. Others might want to set new ones. Please remember though, as part of an Optimist Club, your goals, your dreams, your mission is shared by others. There is not a finite ending date. Our communities will always need our energy. Our kids will always need our programs. Another thing that never changes is the need for new, vibrant people to join us in our endeavors. We must find caring adults to help us carry out our projects, identify new activities and help us reach more children in a positive way. Today, I am in Poulsbo, Washington helping their small club become a larger one. We are touching the community with a walk 'n talk - we walk in to business, talk about Optimist Clubs, talk about community needs, and ask them to get involved. We hope to add members. We hope to build awareness. By reaching out to people with direct one-to-one contact, we share our positive attitudes with others. Try it today. It is a good reminder of how nice your community is and how willing merchants and others are to be involved. This is not a negative post. I am not hater of sports and I understand that some Optimist Clubs are more actively involved in sports programs than others. From an awareness standpoint I would like to point out that Optimist Clubs generally provide more than sports for their communities and the children that participate in the sports programs. So if the home page of your Optimist Club website looks like this one, please rethink your design. Use your home page to promote your club, your purposes and what unifies 3,000 Optimist Clubs around the world: With hope and positive vision, Optimist Club members bring out the best in children. 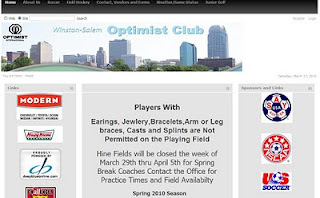 Then create a blog, or a number of blogs, to promote each activity like this fabulous soccer program coordinated by the Winston-Salem Optimist Club and link them back to your website. Your home page defines your club. Do you like what it is saying? When Optimist International first began promoting Youth Appreciation Week, they designed it to correspond with one of the purposes of the organization: To promote an active interest in good government and civic affairs. While I compliment and enjoy seeing so many clubs recognizing children for doing the right things, leadership, scholarship, and sports, I was very impressed to see this program in Albemarle, North Carolina that does it all. The Albemarle Optimist Club Youth Appreciation program recognizes children in a progressive manner beginning with elementary school children. Chosen for their leadership skills, the students shown here participated in the youth in government program and shadowed Albemarle City government officials for the day. Fifteen eighth- grade students were also selected to be a part of the youth in government program. The week was complete with a celebration of the students at the Annual Youth Appreciation dinner where students, parents, teachers, counselors, city council members and Optimist Club members were on hand to show their respect. Photo courtesy of the Albemarle Optimist Club. 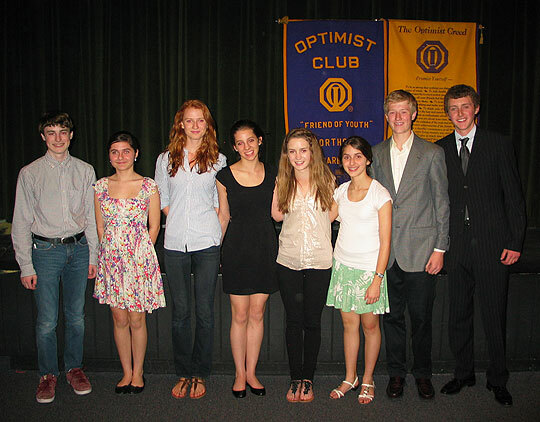 Optimist Clubs are in the midst of holding the annual Optimist Oratorical Contest. This year the students are speaking about “Cyber Communication: Progress or Problem?” I could probably write a different story every day about this activity, but wouldn't it be more fun to just see the kids? Please send me photos of your contestants and I will keep a photo journal of this year's event. Send to linda [at] newoptimistclub.com. 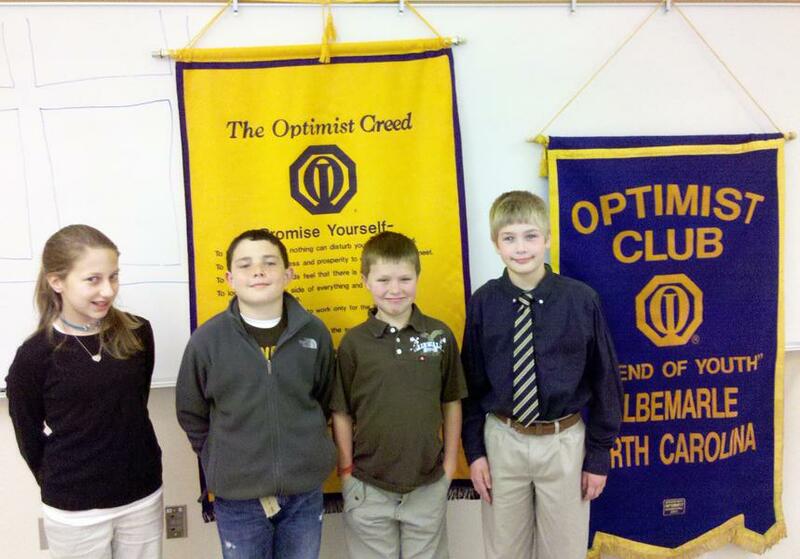 The Optimist Club of Maryville, MO provided this photo of the top three finalists in the Optimist Oratorical Contest. Emily Meyer, center won the regional contest. Shown left is Jacqueline Heath and Gabrielle Hernandez right. 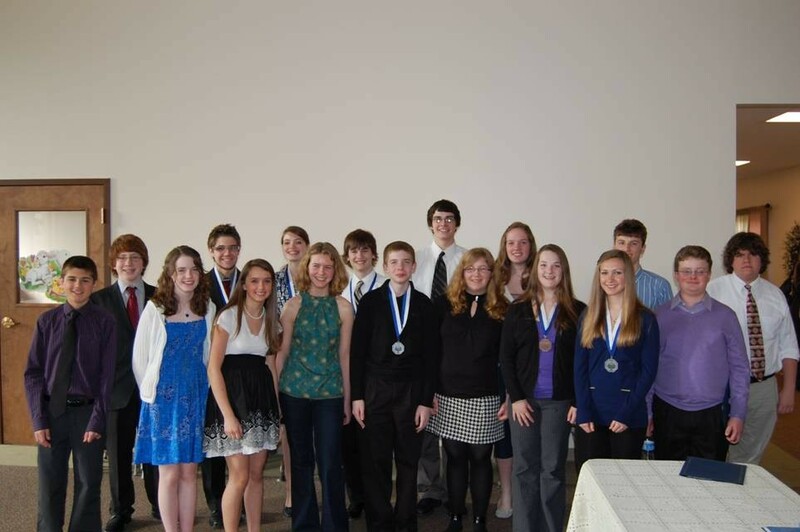 the Brighton Optimist Club's 32nd annual Oratorical Contest. Winners were Andrew Turner, Keith Hutchins, Harrison Jones, Pauline Devlin, Loren Bendzinski and Rebeckah Lafrate. See more at Livingston Daily. com. This picture was taken by Michelle Profant and provided by the Optimist Club of Santa Barbara Northside, Santa Barbara, California. From the left are from left, Zachary Sener, Melissa Marino, Zoe Hunter, Olivia Berci, Daria Etezadi, Caitlin Connor, Andrew McCaffery and Justin Shand. *Please see Pinterest for more pictures of Optimist International Scholarship contestants. Optimist Clubs do a lot of outreach. Some might call their involvement with community service projects other than their own sponsorship or partnership, but when I saw the Garner, North Carolina Optimist Club website using the term outreach to write about the organizations they regularly engage with, I thought, what a great way to express what we do. Outreach is the act of extending or connecting the goals and purposes of one group to another in order to reach a wider population. For their own projects, the Garner Optimist Club manages a clubhouse, sponsors the Optimist Interntional Oratorical and Essay Contests and coordinates baseball, basketball and golf programs for children. They conduct four fund raisers to help them accomplish their goals. Outreach. Does your club actively help others accomplish their goals? You may already practice outreach. Please tell us about it. In Hallie, Wisconsin, another Optimist Club is celebrating their 25th anniversary. Rich Carlson, President of the the Hallie Optimist Club says what he and his members are really celebrating are 25 years of having fun while helping children. President Carlson says the club is attracting many younger members and they encourage their members to give as much time as they like. There is no need to attend every meeting or event.“Do what you like to do,” Carlson said as explained some Hallie Optimist members work only one event, or a few hours a year. “Whatever you put into it, you get a lot more back, just by watching the kids," he concluded. Some of the fun activities that the club sponsors every year are the Halloween Party, breakfast with Santa Claus and the Easter Bunny, a children’s health awareness day, a bicycle rodeo and a youth fishing contest. What is the most popular? Maybe it is just because it's that time of year, but they and the kids really like the Easter Egg hunt and having pancakes with the Easter Bunny. The Abbotsford Optimist Club of British Columbia celebrated their 25th Anniversary earlier this month. I asked them to send me a picture for the PNW District Optimist blog. Perhaps I thought I would get a picture of awards being given or speeches being made. What a pleasant surprise to see happy faces and people enjoying being a part of the the fun. 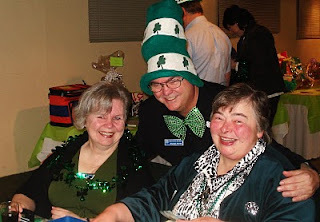 Since it was March, they chose a St. Patrick's Day theme and they shared their special day with the Childhood Cancer Foundation of Canada, raising $3,000 for them through the silent auction. In the picture: Gwen Settle, Stephen Poirier and Carol Lum. With health care reform on everyone's mind in the United States today, I thought it might be a good time to explain something about Optimist International and our chapters known as Optimist Clubs. Optimist International and its federation of Optimist Clubs is organized in the United States and recognized as a 501 (c) (4) social welfare organization. In the United States, a 501 (c) (3) organization, the Optimist International Foundation, exists to receive and distribute funds for charitable purposes. The Optimist International Foundation has established similar funding mechanisms in Canada and the Caribbean where Optimist Club members reside outside of the United States. But why talk about this today? I thought it was important to speak a bit about why service clubs first came to be on a day when our social welfare system has made the most dramatic change in recent history. Service clubs became established in the early 1900s, largely by merchants, to meet humanitarian needs in their communities so that the government could focus on major infrastructure projects such as roads, water, and sewer systems. Service clubs focused on the social welfare of their communities. Merchants who would otherwise be perceived as taking money from their communities found they were able to give back when they banded together as a service club. They developed programs for children identified as being delinquent and created opportunities for all children to develop character. By delivering programs to children, members also developed personal attributes that made them better citizens and better leaders in their homes, social circles, and professional careers. It was about engagement. It was about loyalty. It was about advancement. Today, one hundred years later, service clubs compete with government run programs to make a difference. Service clubs compete with faith-based organizations to make a difference. Sadly, service clubs even compete with individuals - let's call them civic entrepreneurs - who use the model to advance their own agenda. And since the major funder of service clubs - local merchants - now compete with corporations in a global economy, their ability to donate to local programs has changed. Being a social welfare organization has presented challenges and restrictions that threatened the existence of service clubs. Yesterday, the United States Congress passed a health care reform bill that signifies change in the system. Republicans and Democrats did not necessarily agree on what was passed. There will be many months and years of adjustment, negotiation and change. It may look chaotic. It will be challenging. Our social welfare system may appear to be in turmoil. What will not change; however, is the need for children in the United States and around the world to receive care, guidance and attention. What will not change is the need in our communities for civic leaders to step up, be involved, and give to others with needs different or greater then their own. What will not change is the need for like-minded individuals to gather to find ways to meet needs in their communities that are overlooked, underfunded and unforeseen. Now is the time for service clubs to reemerge as the leaders of the communities that they once were. Now is the time to engage with others. Optimist Clubs, this is your challenge. This could be your time to shine. Draw on your background, your heritage, to provide stability, encourage good government, and foster a positive way of life. Do your name proud and help increase Optimism in your community, country and world. 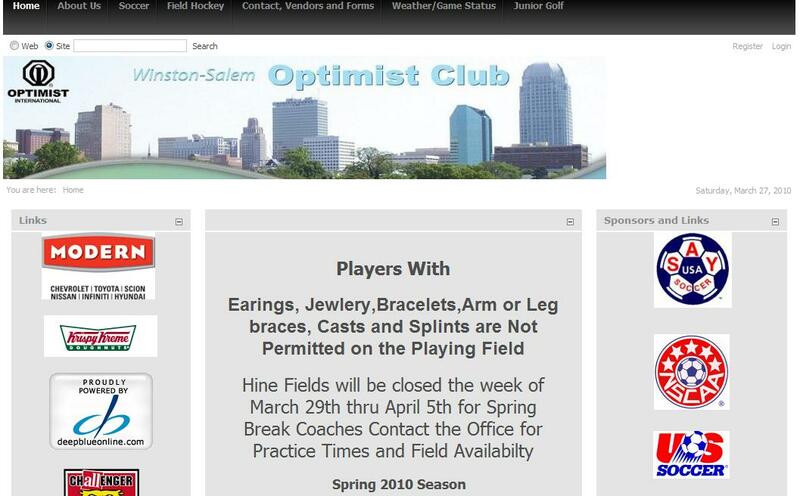 In Plainfield, Indiana, the Optimist Club has scheduled youth soccer league sign-ups beginning April 2. In Boise, Idaho, the Noon Optimist Club is preparing for youth football sign-ups on April 17. In many cities, Optimist Club baseball and softball sign-ups are well underway. But in Lincoln, Nebraska, there is a special baseball league sign-up for children 5 to 17 who are physically or intellectually challenged. This baseball league is known as Homer's Heroes and with the help of the Lincoln, Nebraska Optimist Club, children of all abilities get the opportunity to play. The Optimist Club of Kingsport, TN and the Greater Kingsport Boys and Girls Club recently combined efforts to put on the Annual Bike Rodeo. Children who had never ridden a bicycle before had the opportunity to learn to ride and to learn safety tips. With a donation from Wal Mart, they were able to give away 50 bikes and helmets iin a random drawing. The Missouri Valley Optimist Club needs your help! Your mission, should you choose to accept it, is to be a part of the world's largest Bunny Hop. If more than 3,800 people join them at the Dakota Zoo, March 27, 1:30 pm, they hope to hop for five minutes and secure a place in the Guinness Book of World Records. Bunny ears are required and the fun is guaranteed. Call your friends and family and join the Optimist Club at the Dakota Zoo, 602 Riverside Park Road, Bismarck, ND. The Annual Easter Egg Hunt will take place immediately before the Bunny Hop. Show up early so the Optimist Club can count you in. Find out more about the Bunny Hop here. How awesome is this? Mr. Donald MacDonald of Oakville, Ontario Canada just became a multi-millionaire. He won $10 M in the Lotto Max Canadian lottery. First on his list of things to do: Go to Europe. Second: Donate to the Optimist Club. Congratulations Mr. MacDonald and thank you for thinking of the organization and people who work so hard to bring out the best in children. Your donation will make a difference. Sixteen lovely young ladies are vying for the title of Miss Bixby, Oklahoma in the 31st Annual Optimist Club Miss Bixby Contest. The event takes place on Saturday, April 3, 2010, but so much goes on before the contestants take the stage. In the weeks leading up to the event, the ladies practice; they participate in mock interviews, practice walking on stage with lights and using microphones, learn poise and discuss fashion and evening gown appearance and their overall image. It is more than a beauty contest; the Miss Bixby Contest teaches poise and helps participants develop character and presence. And for the community... a $5 entry fee to watch these young ladies as they perform helps raise money for scholarships for students from the Bixby area. It is victorious night for the community. Best wishes to the ladies and the Bixby Optimist Club. Photo courtesy of the Bixby Optimist Club. The Optimist Club of Keego Harbor, Michigan invites members and non-members alike to contribute to their scholarship fund. For a mere $100, they will make you known in the community as a Friend of Youth. All donations are tax deductible through the Keego Harbor Optimist Club Friend of Youth Scholarship Fund set up with the Optimist International Foundation. 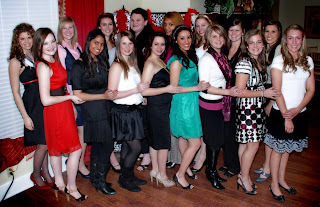 In 2008, the club reported that more than $36,000 in scholarship funding had been given to 45 students since the fund's inception in 2000. Getting members involved in club activities is always important; but it is equally important to find ways for community members to make a difference through your Optimist Club even when membership is not an option for them. Optimist International encourages a program that makes a Friend of Youth a member in a local club. I like the idea of using 100% of a local donors money to benefit an actual program and the Friend of Youth Scholarship program does just that. With more than 100 million people actively using Facebook, it surprises me that every service club wouldn't use this easy medium for communicating with their members. Of course, that would mean every Optimist Club member would need an account and for now, I guess that just isn't going to happen. What I will continue to do is talk about how easy it is to connect through Facebook. No more updating email addresses when they change. It is simple to create photo albums, announce events, share opportunities and announce accomplishments. 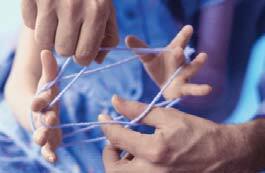 It's not the same as a club meeting, but it is fun and a great membership retention tool. 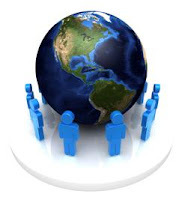 Join Facebook today, meet your friends, talk with your family and make new acquaintances and stay connected. Find the PNW District - Optimist International here. We can't wait to meet you! Celebrating twenty-five years of service in a community is truly an honor. The community of Le Mars, Iowa is helping the Optimist Club celebrate their 25th anniversary by recognizing 25 years of impacting children in a positive way. Please take a look at this wonderful article in the Le Mars Daily Sentinel. According to Jerry Haack, charter president of the club, it all started in 1985 with a bicycle safety day, Youth Appreciation Week, essay contests, Respect for Law Week and sports contests. The club added the Just Say No program in 1987 and has continued drug abuse awareness every year since then. Throughout the years the club has sponsored skating, bowling, and recreation nights at the YMCA. The events are always free and years later participants remember how much fun they had with the Optimist Club. The Le Mars Optimist Club has also helped fund large projects in the community like the swimming pool and little league sports complex, but the members always enjoy the projects that let them work directly with the children and make them smile. When the club was started 25 years ago, there were other service clubs in town. However, the 39 members wanted to do something special for children. I think they have accomplished their mission. Thank you to the Le Mars Optimist Club for your service and best wishes for 26 more years. Download the article for the Le Mars Sentinel in PDF. Photo club members planning for the Just Say No program in 1987 courtesy of the Le Mars Optimist Club. The Optimist Club of Mission, British Columbia will host the Annual Youth Talent Show on March 20, 2010. Always popular in the community, the talent show lets children shine and the $5 ticket fee raises money for the other youth serving projects that the club performs throughout the year. The Mission Optimist Club sponsors free ice skating and swimming and coordinates a full color magazine written and designed by students. That is what being part of an Optimist Club is all about. Inspiring children; recognizing children, and helping them to be the best they can be. Some fundraisers look and sound like they will be fun. It might be the activity itself, but more likely, it is the people who are putting on the event. 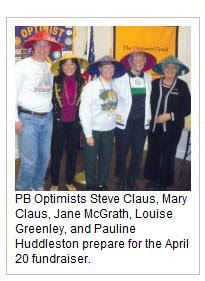 For some reason, the Gulf Breeze Optimist Club members in their colorful bamboo hats look like they are ready to party. The event is the annual fundraiser for the Pensacola Elementary School. The theme is Beach Meets Far East. The menu is Asian favorites such as potstickers, chicken satay with peanut sauce, sweet and sour pork, chicken and vegetable curry, and szechuan beef and broccoli. Attendees are invited to wear Asian attire to the event at Flounder’s Chowder House on Tuesday, April 20 at 6 p.m. Along with dinner there will be a raffle, silent auction and dancing. Sounds like fun with a purpose. Happy fundraising! The movie Akeelah and the Bee made me think differently about spelling contests. I had often thought them curious activities and fun to watch, but I never knew what went on behind the scenes where children learn words and etymology and practice among themselves to be the best. The anxiety that they portray onstage lives with them for months and years. Winning is a monumental accomplishment of knowledge, poise and dedication. The Grand Strand Optimist Club and North Strand Optimist Club and the The Sun News Educational Foundation of Myrtle Beach, SC helped one young speller advance to the Scripps National Spelling Bee in Washington, D.C., May 31-June 5. David Habibi emerged victorious in the Regional Competition that featured 48 young hopeful spellers. The winning word was ephemeral. Optimist Club fundraisers are often times for fellowship as well. 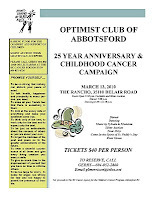 Take the Abbotsford Optimist Club 25th Anniversary for example. This Saturday they will celebrate 25 years of service to their community and they have decided to share the evening event with the British Columbia Cancer Foundation. The evening will include dinner, dancing, a silent auction and door prizes. 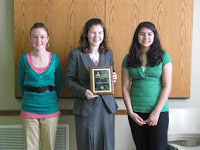 The Gretna Optimist Club of Gretna, Nebraska had more than 150 entries in the 2010 Optimist Essay Contest. All students wrote on the topic "The Internet: Today's Evolution or Tomorrow's Menace?" Preliminary judging was provided by Gretna High School faculty members. The top twenty percent advanced to the next level of judging, an independent panel of judges who determined the top three winners for the Optimist Club. Coming in first was Dustin Herring, second Madison Healy, and third Aaron Dittmar. Dustin's essay will move forward to the Nebraska District Optimist Competition. What is unique about this particular story is the newspaper's response to the contest. They devoted space to to publish the winning entry. What a great way to recognize our students. Photo courtesy of the Gretna Optimist Club. Left to right, Aaron Dittmar, Dustin Herring and Madison Healy. Radio station KCII is an integral part of the fundraising strategy for the Optimist Club of Washington, Iowa. Together they are helping "raise the roof" at the popular teen hangout Hamakua Place. They began with a $500 challenge donation and are looking for others supporters to kick in. The KCII website lists the ongoing activities of Hamakua Place and the Optimist Club. Most radio stations will list community events and fundraisers. Isn't it great when they write about them and have the on-air personalities talk about them too? Seventy students in Redlands, California were recently honored by the Redlands Optimist Club. According to Richard Pennington, Chairman for the event, "We are honoring top students for their accomplishments in academics, athletics, arts, and for their contributions to the community." Youth appreciation is one of the main purposes of an Optimist Club. Sometimes we recognize kids for doing the right things, or making the right choices. Often we recognize them for athletic ability or scholarship. And sometimes we make a choice to honor top students for being well-rounded students, involved in community, academic and extracurricular activities. That was the theme for the Redlands Optimist Club event. Six schools were represented by their top students. Taylor Guerrero, 17, a senior at Redlands East Valley. "Out of like 3,000 people at our school, there's like 900 people in our class. It's awesome to have 20 kids come. It's just a great honor to be here - it's amazing. And we really appreciate them honoring us." The keynote speaker, University of Redlands President Emeritus James Appleton encouraged them to move past their honors and continue to do more with their talents. He challenged them to be leaders, scientists, physicians and to "blaze new trails in science, art and politics and engineering." "There are a thousand symphonies yet to be written," Appleton said. "You could be those people." If one line, or five words could sum up what we do as Optimist Clubs, I think that line might be it. Every child is unique and talented in their own way. Optimist Clubs offer the ability for children and adults to be involved, do more in their communities and to be the people who influence a better quality of life for all. The Optimist Club of Oregon City, Oregon is getting ready for a big celebration. It's called Pioneer Family Festival and it is a three day weekend packed with carnival rides, midway entertainment, vendor booths, festival food, Teddy Bear Parade, safety displays, and history preservation displays. In addition to the usual fun of a weekend festival, there is also a BMX competition and a skateboard competition. New this year is an Arts in Action Area where urban artists will demonstrate aerosol artwork. (Can we say graffiti?) This is one way that the club keeps the allure of history engaged with current affairs. All of the fun is scheduled to take place at Clackamette Park on May 14-16, 2010. Make your plans now to attend! Optimist Club program chairpersons are probably aware of this problem. 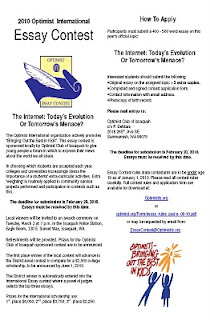 Optimist International has created an application for the Optimist Oratorical Contest and Optimist Essay Contest that contains so much fine print that one might wonder is it worth it or will I agree to something that I really don't want to do. What's the solution? Make a flyer that is easy to read. 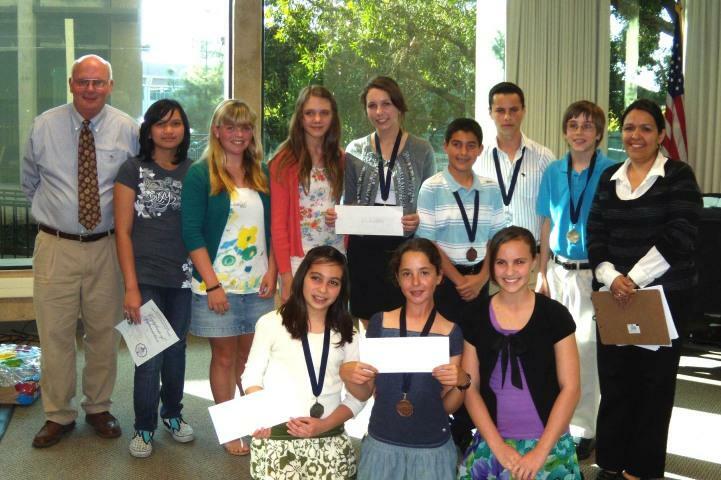 The Optimist Club of Issaquah, Washington has great success with the Optimist Essay Contest. I think it has a lot to do with their simple, straightforward marketing approach that begins with this flyer. The Issaquah Optimist Club has also secured a good relationship with their school district and the scholarship contests are published on the school district websites. It does take a little work to promote activities in your community, but the increased participation will make it all worth it. Many Optimist Club are preparing for or holding the Annual Optimist Oratorical Contest. Some clubs. like the Optimist Club of Oshkosh, Wisconsin are successful in finding lots of contestants. Others struggle to get the word out. I often wonder with at least 48 scholarships of $2,500 given away each year, why it would be so difficult and the answer always comes back to communication. Like individuals, some clubs are just better communicators than others. Some people just know more children or have better access to those who influence children. So my suggestion is to talk and write about the opportunities offered by Optimist Clubs as often as possible. We can submit press releases, but then we are at the mercy of a news reporter, an editor and space. So I am encouraging everyone to begin their own Optimist Club blog. Click on the link at the top of the page and start yours today. It's free, it's easy and it's connected. When you are done creating and writing your first post, be sure to add your comment here with a link to your new site. Let's see if we can get ten new blogs by April 1. Are you ready? Just do it! How does listening to 200 students all speaking on the same topic "Cyber Communication: Progress or Problem” sound to you? To me and probably anyone associated with an Optimist Club, it sounds like an epic success. The Noon Optimist Club of Oshkosh, Wisconsin and the Oakwood School PTA combined their efforts this year to have such a large number of participants in the Optimist Oratorical Contest. Each student that participates receives a certificate of participation and a ribbon or medal. The top male and female speakers also earned $100 and the opportunity to advance to the district competition where they will compete for college scholarships up to $2,500. The Optimist Oratorical Contest is the longest running program sponsored by Optimist International. It began in 1928 and the need for public speaking skills remains as critical today as it did then. One of the unique aspects of the Optimist Oratorical Contest is that it requires participants to speak to the same topic. Students can be very passionate and persuasive about certain topics; asking them to speak to something else requires personal development and the ability to research and reflect. The Optimist Oratorical Contest is without a doubt this writer's favorite program. Kudos to the Noon Optimist Club of Oshkosh, Wisconsin for inspiring so many students to participate. Sunshine Acres in Mesa, Arizona celebrated their 50th Anniversary on February 28 and the Mesa Optimist Club was there to help. Sunshine Acres is group home for children whose parents are drug addicts and alcoholics. About sixty children live n site. One of their greatest accomplishments is using animal therapy to help the children open up, build self esteem and social skills. They partner with the 4-H Program where the children can also learn to work with larger animals like horses and steers. For their part, the Mesa Optimist Club prepared 2,200 lbs. of barbecue beef for a fundraiser for the home. They hoped to rais $24,000 for the nondenominational group home that runs on grants and donations. See all about the fantastic day in the East Valley Tribune. Optimist Clubs certainly do a lot of fundraising. In fact, fundraising and fundraiser are two of the top topics on this blog and that concerns me a little because I specifically look for club programs where the impact in the communities and children that we serve is easy to recognize. I wonder, have we become so used to raising funds that the reason we need the money has become an afterthought? 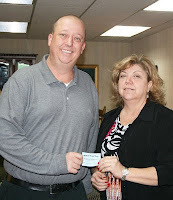 "The Cedartown Optimist Club is selling tickets for its annual Ham & Egg Day fund-raiser. The ham and egg breakfasts will be served at the Goodyear Civic Center from 6 a.m. to 12:30 p.m. on Saturday, Feb. 27. Proceeds from the ticket sales will go toward youth programs in Polk County. Tickets may be purchase from any Optimist Club member. Tickets may also be purchased downtown at The Law Firm (Mundy and Gammage)." Aside from the fact that the price of the breakfast is not given, I guess this blurb accomplishes what it set out to do: inform residents that they can support youth programs by buying breakfast from the Optimist Club. But where is the passion? Where is an example of a youth program? Where is the explanation of how it benefits me? Chuck Burford and Jean Crane and the Cedartown Optimist Club invite you to join them for the annual Ham and Egg Breakfast on February 27 to benefit youth programs in Polk County. According to Burford, more than three hundred children participated in activities sponsored by the Optimist Club last year including middle school student John Jacobs. Jacobs took first place in the Optimist Oratorical Contest for the Georgia District - Optimist International and collected a $1,500 college scholarship for his effort. "It is so important that we offer local opportunities like the Oratorical Contest to the students in our community," said Crane. "And think, you can help more students have these kind of opportunities just by eating breakfast." Make your next fundraiser more personal and you will sell more tickets. Even better, explain why you are fundraising and you will attract more publicity.